I’ve been to London several times over the years, so on this most recent visit I decided to skip the main tourist attractions and instead, spend my days standing on stranger’s porches, taking photos of their homes. 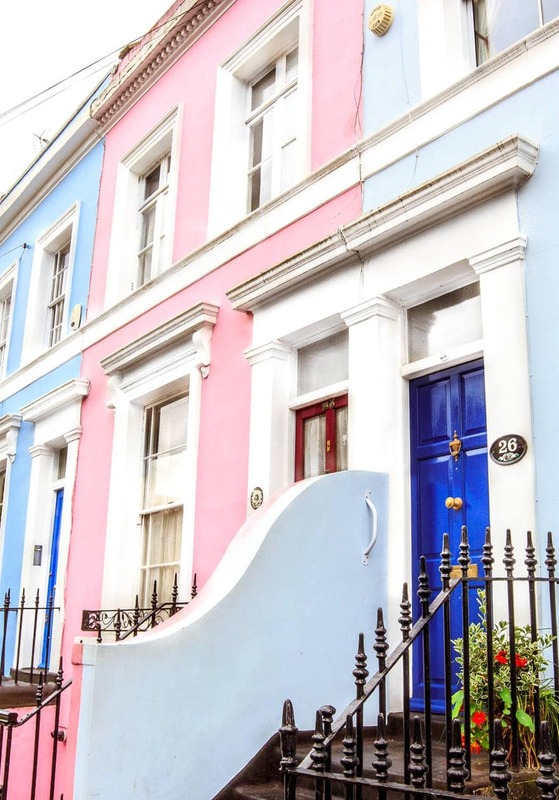 Notting Hill is an affluent area best known for it’s colorful houses and Pinterest-worthy doors. You could spend hours here, zig zagging up streets, sipping tea … and looking for Hugh Grant. 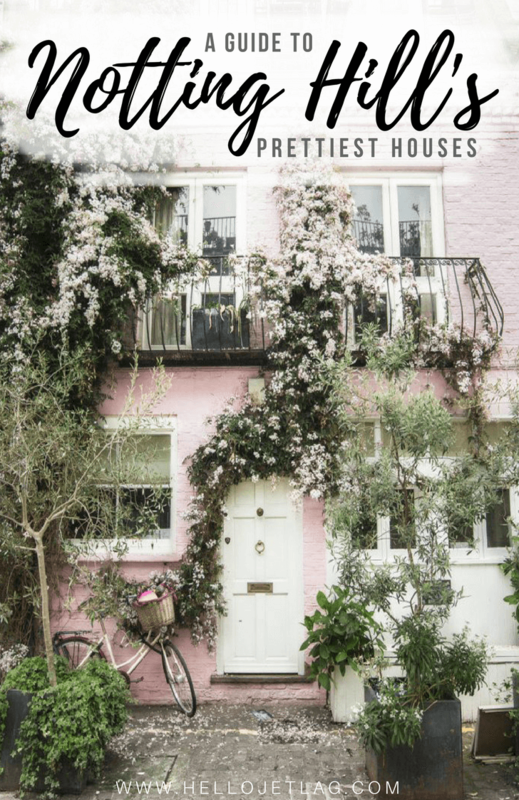 Keep reading to take a walkthrough of one of the most visually appealing neighborhoods in London, and discover the prettiest Notting Hill houses. 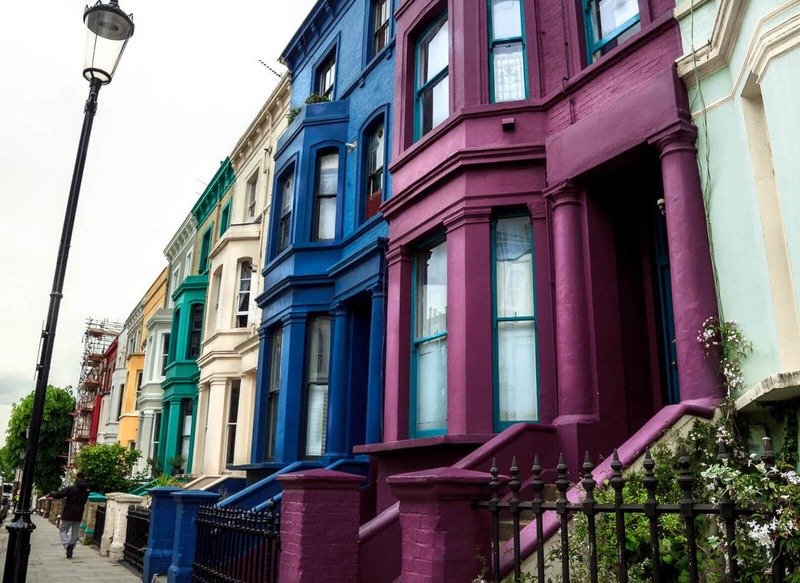 I was not super familiar with Notting Hill, so I used A Lady in London’s Self-Guided Walking Tour to give me a basic lay of the land. I strayed quite a bit from her directions, but really enjoyed the parts I did follow. I recommend it if you want a full Notting Hill walking tour. 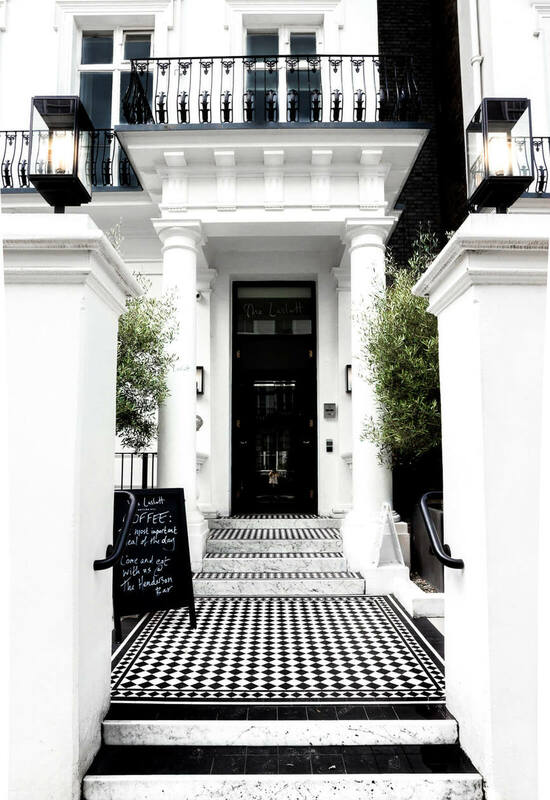 Our first facade is located on Pembridge Gardens, right around the corner from the Notting Hill Gate tube stop. At first glance, The Laslett Hotel doesn’t jump out at you, but I really loved how the black and white duo chromatic color scheme showed up in photos. 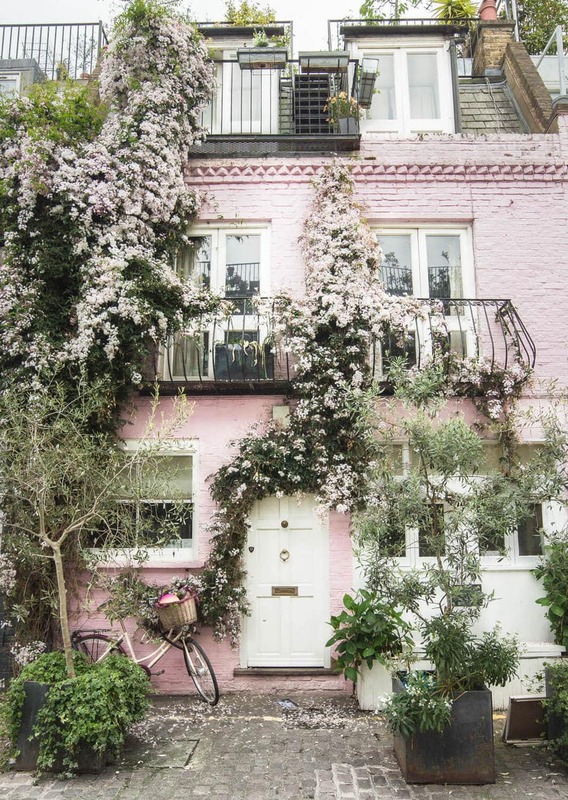 Portobello Road is a goldmine for quintessential Notting Hill houses. 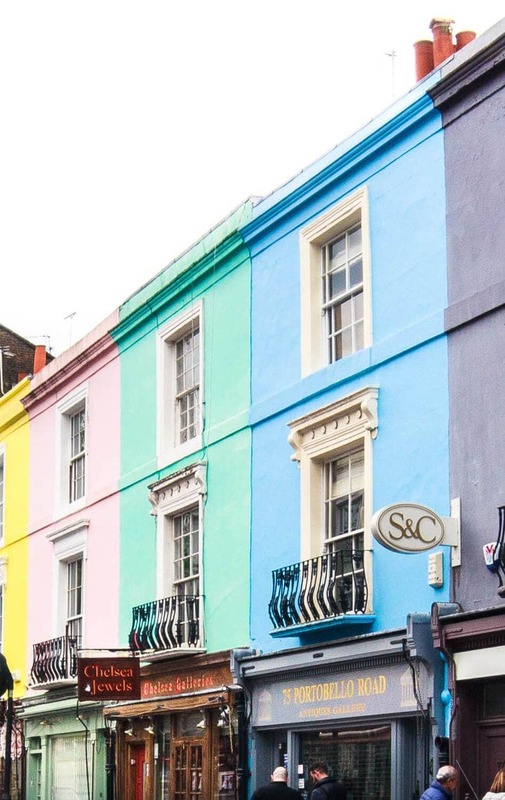 When turning onto Portobello Rd from Pembridge Rd, you’ll immediately spot the colorful shopfronts and cute boutiques. 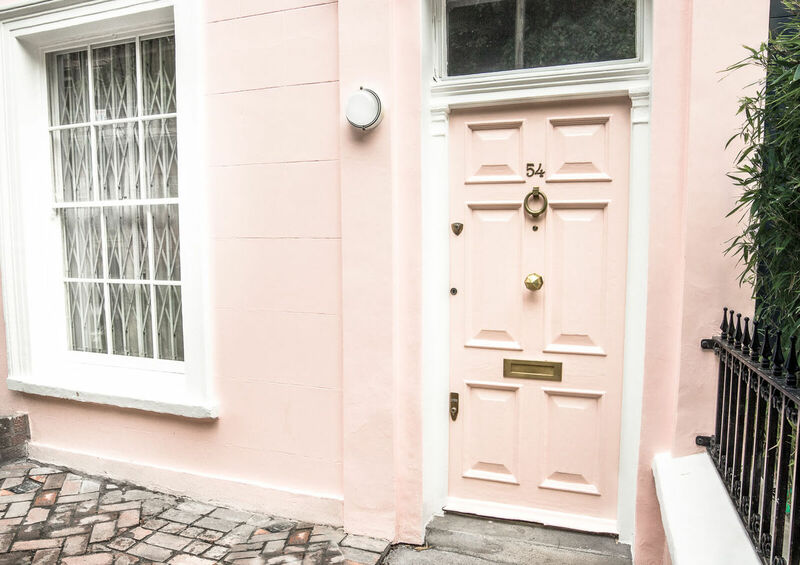 Take a stroll up this road, noting all of the picture perfect doors, flats and hidden mews. 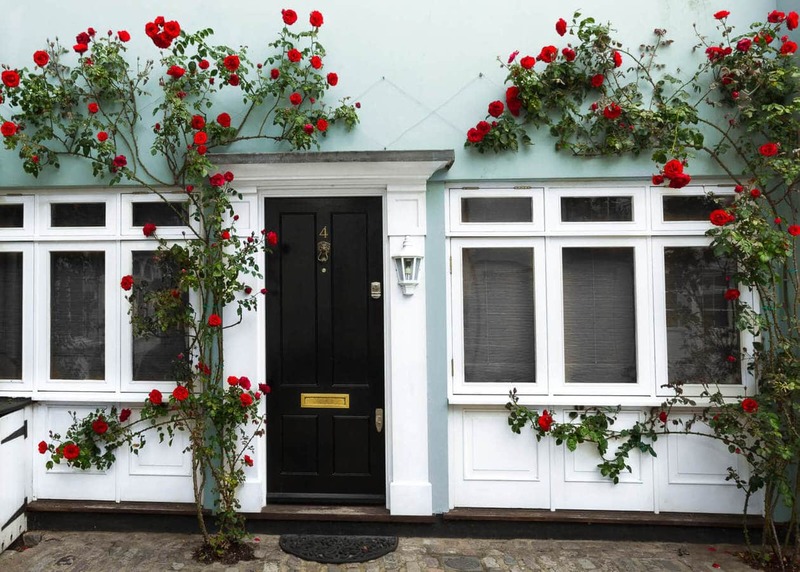 One of my favorite Notting Hill houses was this robin’s egg blue flat, with red roses and white trim. It’s basically what Instagram dreams are made of.. 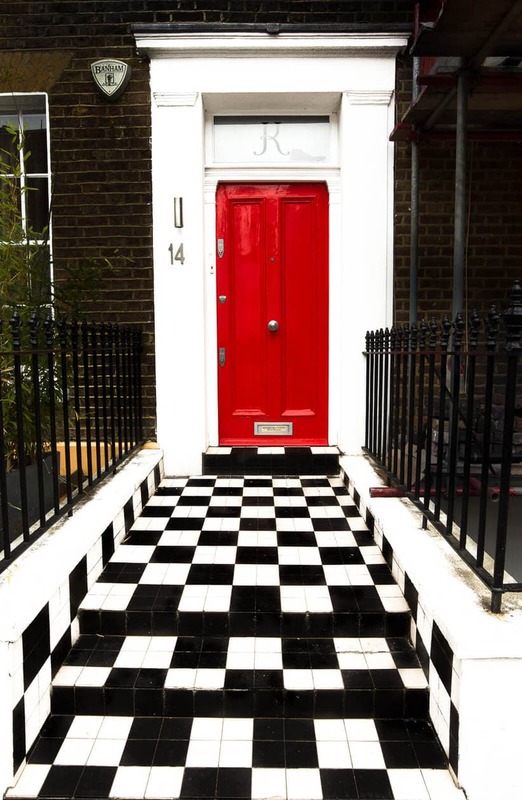 Most tourists walk the length of Portobello Road, without straying much in either direction. While there are some cute shopfronts (definitely check out Biscuiteers Boutiques & Icing Café!) I didn’t love the vibe, so I decided to go rogue and explore the path a little less wandered. 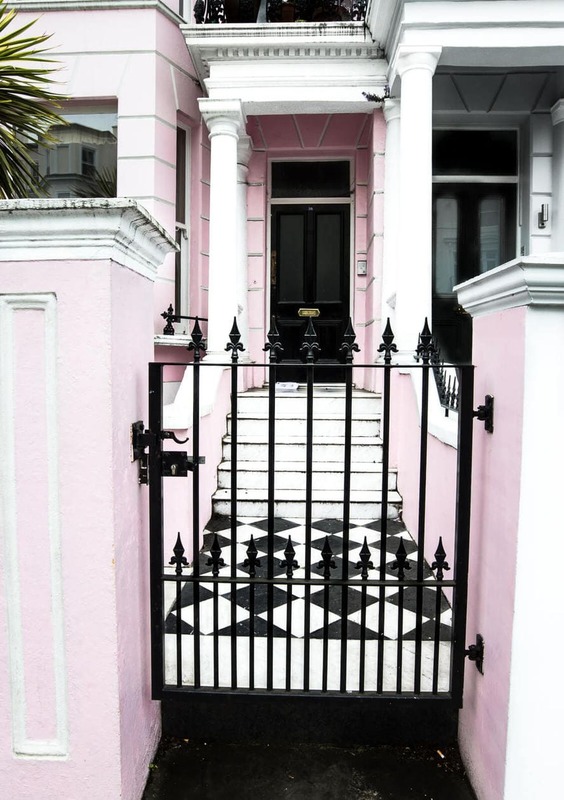 Pink houses are always a win, so check out this one with the checkered walkway, located right off of Portobello Rd on Chepstow Villas. 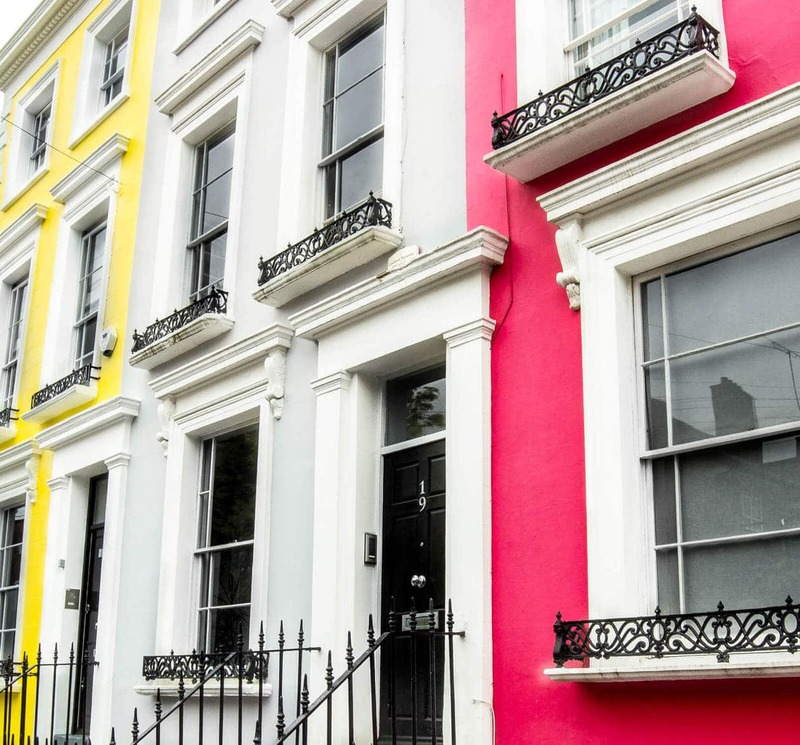 You’ll find another row of colorful homes on Denbigh Terrace, not far from Chepstow Villas. Unfortunately, there are cars parked directly in front, making it difficult to get a good pic. 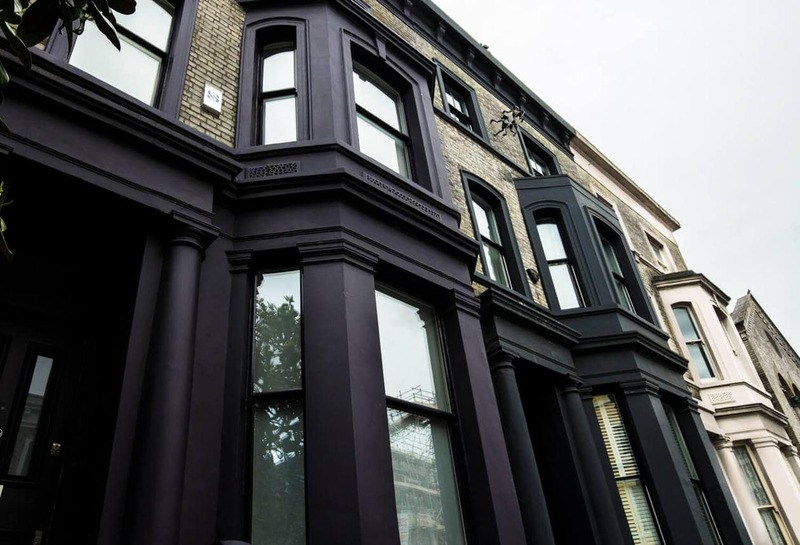 After walking up Denbigh Terrace, turn left on Denbigh Rd and behold this beautiful matte black house on Colville Rd. 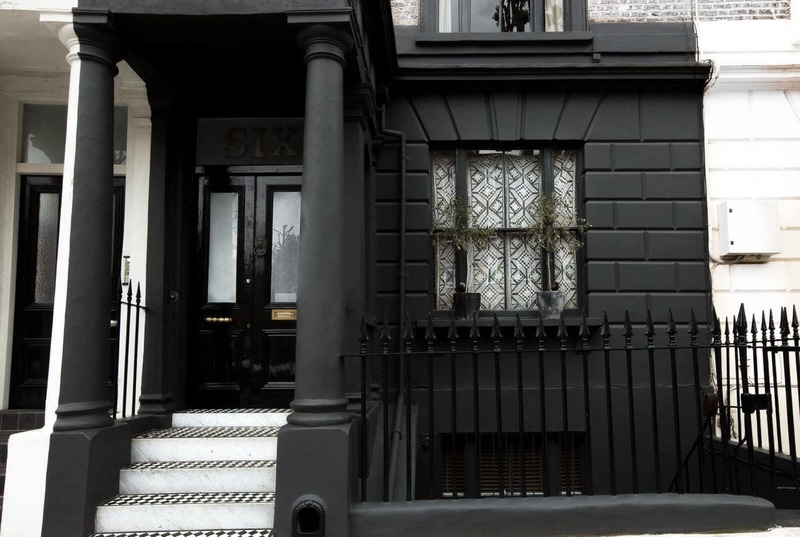 I would trade every pink and red door in the world for a matte black one. Love. 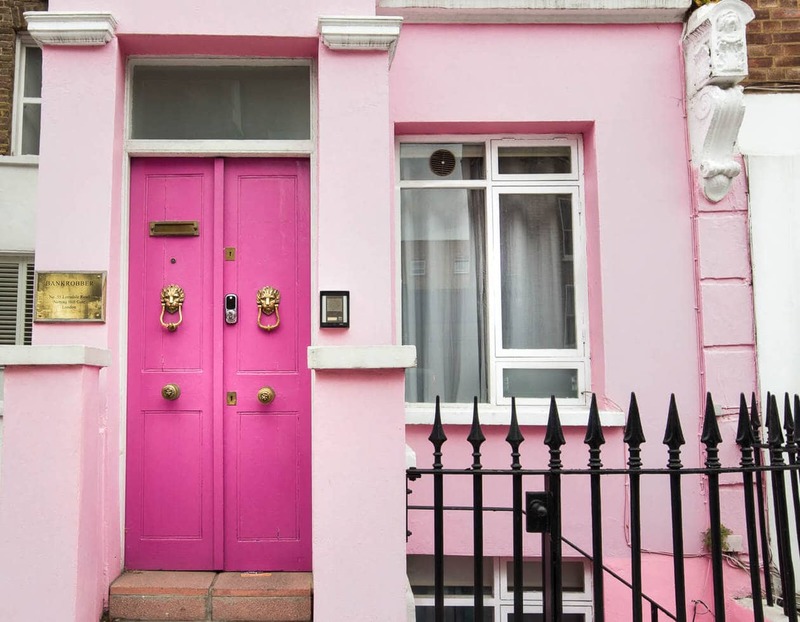 Right around the corner from the black home is another adorable pink one, complete with gold lion’s face door knockers. It was hidden amongst a ton of construction surrounding it. But that’s the beauty of a photo.. you’d never know by looking at it, that there were 4 construction workers standing by, waiting for me to finish so they could walk past. 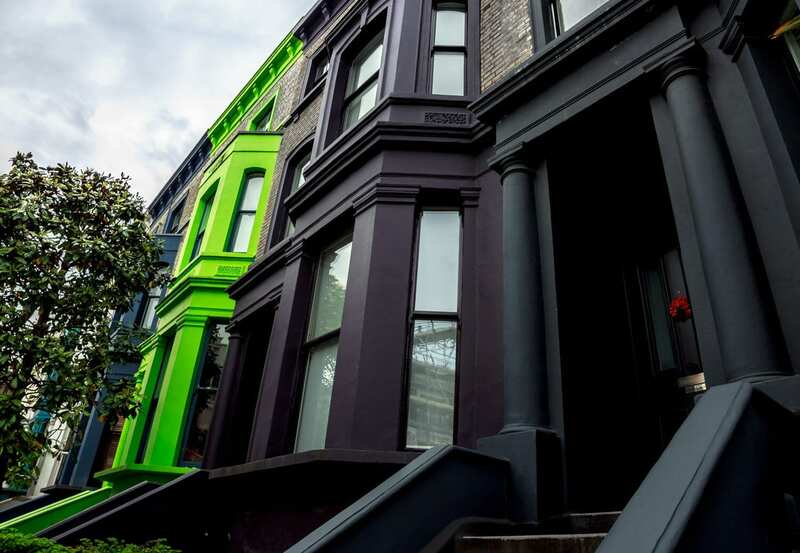 Lancaster Road has 2 rows of brightly colored houses facing each other. On one side of the street, the houses were a bright and vibrant mixture of purple, blue, green and yellow. The other side had a deeper color palette with bright pops of lime green and ballet pink. Definitely a Notting Hill staple. 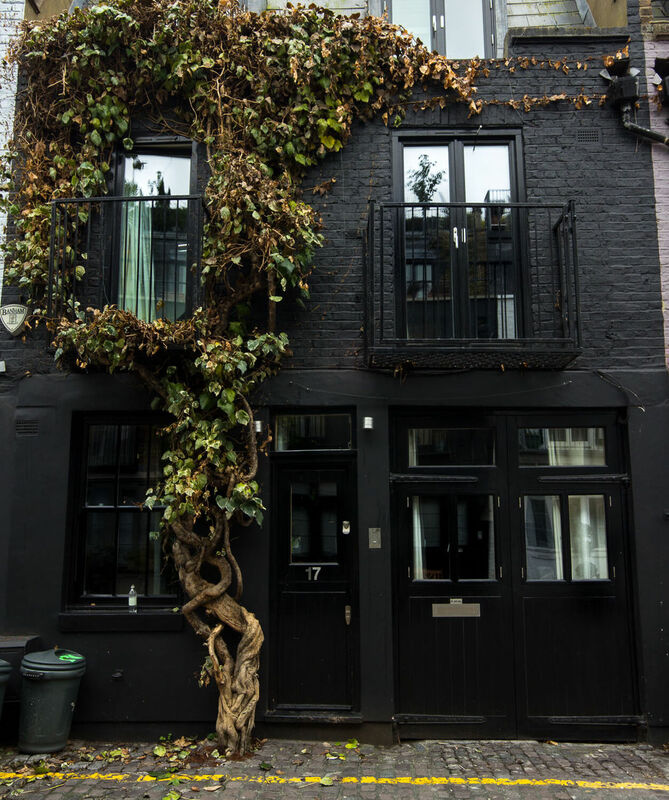 Just a short hop, skip and a jump from Lancaster Street you’ll find St. Luke’s Mews. You might recognize this mew from the cue card scene in Love Actually. 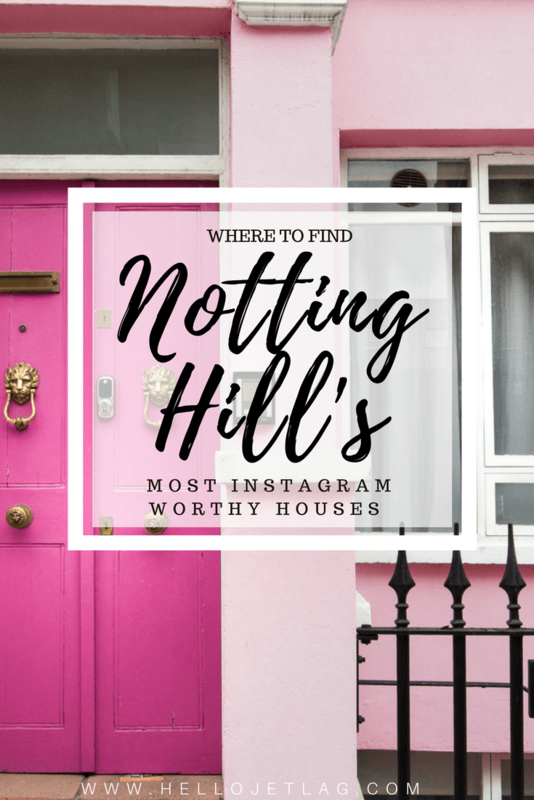 Check out the Google map above to pin-point the exact location of all of the Notting Hill houses from this post and if you have any other additions, please leave them in the comments! 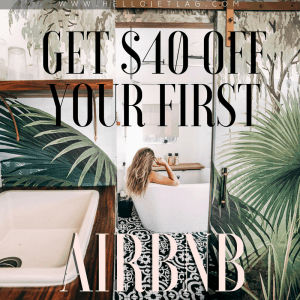 Loving your blog, it’s very funny! I will use these tips/maps when I come to London next month as I’ve never been to Notting Hill before. Thanks! ??? I’m glad you found it helpful! Thank you so much for reading!